Attention-Deficit/Hyperactivity Disorder (ADHD) is a neurodevelopmental disorder that emerges during childhood. However, it is now well recognized that ADHD frequently persists over the lifespan and well into adulthood. Although ADHD is typically first identified during the childhood years, the presentation of symptoms may differ considerably between adults and children. Without appropriate symptom management, ADHD can significantly interfere with academic, emotional, social, and work functioning. When properly identified and diagnosed, however, outcomes in adults with ADHD who receive appropriate treatment are encouraging. This volume in the Advances in Psychotherapy series is both a compact “how to” reference, for use by professional clinicians in their daily work, and an ideal educational reference for practice-oriented students. The most important feature of this volume is that it is practical and “reader friendly”. It has a similar structure to others in the series, and is a compact and easy to follow guide covering all aspects of practice that are relevant in real life in the assessment and management of ADHD in adults. Tables, relevant case studies, and marginal notes assist orientation, while suggestions for further reading, support groups, and educational organizations are provided for individuals and professionals. A companion volume Attention-Deficit/Hyperactivity Disorder (ADHD) in Children and Adolescents is also available. "Like all of the books in the Advances in Psychotherapy series, this one provides a thorough understanding of a complicated and common disorder, ADHD in adults. A wonderful feature of these books is the usefulness across clinical, research, and academic settings. 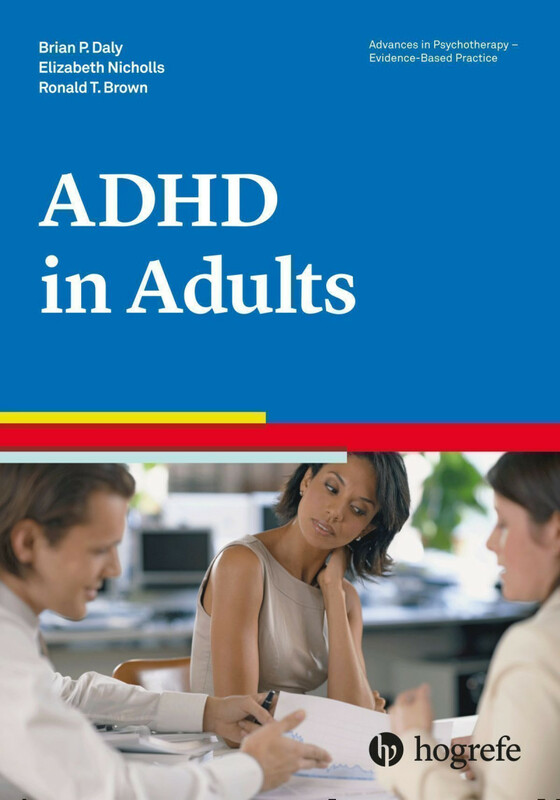 This guide thoroughly examines the complexity of ADHD presentation in adulthood and describes in detail the numerous steps from diagnosis to treatment. The authors cover the basic terminology, diagnosis, epidemiology, comorbidity, scale assessments, and various pharmacological and nonpharmacological treatment options [and] provide an unbiased and empirically supported discussion with great examples and wonderful charts. I am thoroughly impressed with this latest volume in the Advances in Psychotherapy series. This is truly one of the best books I have reviewed this year and I recommend it for every clinician." "Although this book would be useful for any professional trying to understand adult ADHD, it is particularly useful for clinicians. A thorough reading of this book would take only a few hours and would give a therapist or counselor a solid base for providing assessment and/or treatment services for adults facing difficulties related to inattentiveness, hyperactivity, impulsivity, and/or restlessness. Information regarding descriptions of adult ADHD, theories about the condition, diagnostic considerations, treatment approaches, and case examples are all contained in their own separate chapters. There are many treatment approaches and assessment methods available for ADHD, and this book gives solid direction for understanding how they best can be used with adults. The authors have clearly given attention to making this book both practical and informative. Their compact text offers information supported by solid empirical research. A reader can recognize quickly not only what the research concludes about a particular topic, but also what studies are most important to that topic. This makes the book useful not only to clinicians but also to researchers who want a good starting place for understanding the current state of ADHD." “This book is a comprehensive, state-of-the-art guide to understanding, assessing, and treating ADHD in adults. The authors have done a masterful job of using current theory and research to inform clear, concise recommendations for clinical practice. This text is an indispensable resource for all health professionals working with the ADHD adult population." “It is now clear that ADHD can persist into adulthood and impact the lives of millions. Daly and colleagues give us a rich, in-depth overview of the problem with coverage of theoretical foundations, diagnosis, assessment, treatment, and case illustrations. This book is high in scholarship, pioneering in content, and a critical resource for research, training, and practice. In view of what we know about the risk factors associated with ADHD, it is paramount that we focus attention on this adult population. Read this book!" “This book provides a thoughtful yet practical approach to the synthesis and discussion of current literature. The authors supply a straightforward and clinically relevant review of this topic, from theories and models of ADHD in adults to diagnosis and treatment."